Eduardo Santiago, celebrating year two as an Idyllwild homeowner, said he enthusiastically jumped into the Idyllwild community with both feet. 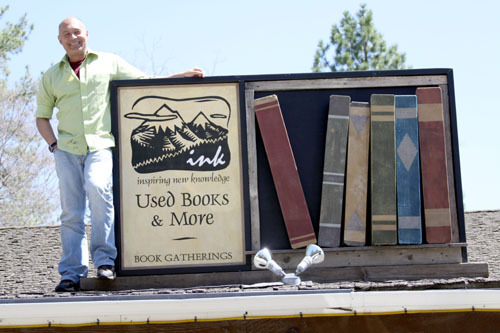 Part of that jump included founding a free Idyllwild Authors Series last year to try to help preserve a struggling independent bookstore. Santiago has lined up 10 prominent Los Angeles writers from a variety of literary disciplines for the series’ second year. He said there is something about each of this year’s featured writers that piques his curiosity. And although the quality of their work is comparable to last year’s authors, much has changed for the series. Last year Santiago created his series from nothing, with no funding and no guarantees of support. He launched his enterprise as a gift to the community, fueled solely by his commitment to the printed word, his infectious imagination, and his energy and belief in his purpose. Many A-list Los Angeles authors made the trek to Idyllwild just for the joy of discussing their work, promoting literature and supporting Santiago’s goal of saving the bookstore. “They were paid nothing, not even gas money,” said Santiago, amazed that so many recognized writers would respond to his invitation. Santiago said this year builds on last year’s success. “I now have enormous and faithful support from the Idyllwild community,” he said. That support takes the form of strong attendance at each author event and donations from local businesses that help promote the series and house and feed featured authors. Also this year, thanks to donations from Los Angeles nonprofit PEN Center USA, and unflagging enthusiasm for the series from PEN’s Executive Director Adam Somers, Santiago will have money to fund small author stipends and transportation expenses. “He [Somers] sees such growth potential [for the series],” said Santiago. Santiago decided to include Verney because of the premise and quality of her book. With Snyder, he wanted him to discuss his experience of self-publishing his works. “Self-publishing used to mean generally lower quality, maybe some editing omissions, but the publishing industry has changed dramatically and self-publishing is on the rise, following the route of indie films, recordings and YouTube,” said Santiago. “I thought it might be interesting to get that author point of view.